The temples of Bali are some of the grandest and most beautiful temples in South East Asia and there is none more impressive than the Besakih Temple. 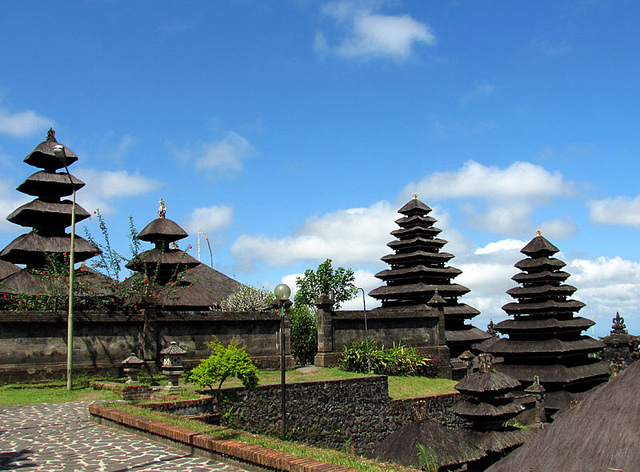 Besakih Temple, also known as the mother temple of Besakih is Bali’s largest and holiest Hindu temple. Situated at an altitude of 1000m on the slopes of Mount Agung, Besakih is a visually and architecturally impressive sight consisting of at least 86 temples. If the Besakih Temple takes your breath away and you are looking for more spiritual wonder the Tanah Lot Temple is possibly Bali’s most pure and iconic spiritual destination. This stunning sea temple is situated on a large rock, which is constantly battered by the surrounding ocean. Tanah Lot Temple has been described as one of the most amazing places to witness a sunset in the whole world. Uluwatu is the final must see temple. Situated on the south-western Bikit peninsula it is another ideal spot for a dreamy sunset, a great place to witness Kecak fire dances and surrounded by a forest of bountiful natural wildlife and monkeys. If you need to let your hair down in Bali, Kuta Beach is the bars and clubs loci of the province. This vibrant destination hosts one of South East Asia‘s most famous party scenes and will be sure to keep you up until daylight. The Kecak is a ritual dance created in the early 1930s by German artist, Walter Spies. The dance features an impressive chorus of up to and over 100 male performers, featuring sensational and hypnotic choreography which will blow your mind. The small village of Ubud is rapidly becoming one of the most popular spots for travellers. Full of traditional charm, quaint beauty, Ubud is full of markets, shops and stall selling an incredible array of traditional arts and crafts. Bali is teeming with exotic and impressive natural wildlife. The Ubud monkey park, the Bali Safari and Marine Park and the Elephant Safari Park of Desa Taro are just three destinations in which you can experience animals such as elephants, tigers and monkeys first hand. Garuda Wisnu Kencana is a cultural park on the mountainous southern coast of Bali. The iconic and enormous statue of Vishnu riding on the back of a ‘garuda’ (a large eagle), is still being built and is one of the most popular attractions within the park. This park has also become a centre for art and cultural performances, theatre and exhibitions. The active volcano of Batur provides one of the most impressive views of the lake below and the surrounding countryside. Take a local cab to the top of Mount Batur and hike around the amazing countryside. The Goa Galah or Elephant Cave is one of the most beautifully time worn and weathered pieces of ancient architecture in the world. Carry on inside the cave to find the broken statue of a giant Buddha sculpture that collapsed and fell from the cliff above the cave. Lloyd documents his travel and culture experiences on his own website as well as various other publications and blogs. He is currently working on behalf of Cheapflights Australia.